There are plenty of very nice Palais between the Michaelerplatz and the Freyung Square, but the Palais Kinsky to the opposite of the Schottenstift Abbey is one of the most splendour-laden ones and worth a closer look: It has all the "ingredients" of a typical Baroque Palais, but is somewhat distorted due to its funny outlay. For an introduction on what a Palais is at all, I recommend to read my article on the "Palais of Vienna". Here some more on the Palais Kinsky with its playful facade: The Kinskys are old Bohemian nobility and there are still several members of the family who live in Vienna and its surroundings. The site of today's Palais Kinsky belonged to the Counts of Lamberg since the 16th century. In 1709, it was sold to Phillip Laurenz Count of Daun. Later, the property was transferred to Wirich Philipp Count of Daun, who hired the star-architect of late Viennese Baroque: Johann Lukas von Hildebrandt. Between 1713 and 1716, von Hildebrandt designed one hell of a Palais - provided that there was relatively little space available, a masterpiece of his. Von Hildebrandt's skills are most obvious if he has more space, as in the Belvedere, the Blauer Hof of Laxenburg or Schloss Halbthurn in the Burgenland. With the Palais Kinsky, he had to squeeze his elaborate style into a narrow gap between other Palais: 30 metres wide, 90 metres long - a very unusual ground shape for the 24 metre high building. Especially since the Baroque age emphasised representative entrances, idealised by very wide side-wings; impossible in the case of Palais Kinsky. Instead, Lukas von Hildebrandt divided the 24 metres into four levels, built a long staircase (another key feature of late-Baroque Palais) with famous frescoes, and put much dedication on the design of the facade. The latter one should become the most splendid of central Vienna. After 1746, the Palais was passed through the "who is who" of Austrian Imperial nobility - there was almost no highly noble family that didn't own it at some point: First, it went to Johann Joseph Count of Khevenhüller, in 1764 to Ferdinand Count of Harrach, then let to Empress Maria Theresia who used it for her personal guard, the Schweizergarde. Then the Kinskys inherited the Palais, gave their name to it and kept it until 1986. After WWII, it was home to the embassies of China and Argentina. In 1986, it was sold to a real estate company that refurbished it extensively and now lets it to various companies, art galleries and private individual. 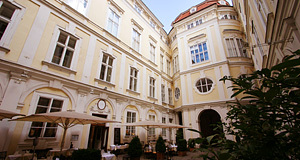 The Palais Kinsky is also home to a famous auctioneer, and the marble hall is regularly used for concerts and receptions. There are tons of attractions nearby: The Freyung and Palais Ferstel, the BA-CA Kunstforum, the Am Hof Square with the Zeughaus; the Votivkirche, the Pasqualatihaus and the Dreimäderlhaus; the Main University, Burgtheater and Rathaus; the Minoritenkirche and surrounding Palais - and a lot more.